“Dark & Saucy,” the 2016 release by Misty Blues, art by Michael Mongue. Buy Now. For your listening pleasure we have on the phone, Gina Coleman, front woman and founding member of Misty Blues (website), Berkshires-based blues band that has the sound and feel of some of the great blues power lineups of yore, except that they’re one of the great blues power lineups of today! Their new album, “Dark & Saucy” is, well…do I have to even tell you? Gina shares some standard “making of,” details, but then takes us deeper into the mind and heart that makes up Misty Blues. But that’s what we DO here at INDIEcent Exposure, right? You don’t come here for sound bites, you come for a meal, and, as usual, you aren’t going to leave hungry. EXCEPT, I expect, hungry to catch Misty Blues LIVE in the near future and to pick up a copy or download of “Dark & Saucy,” both things we’re going to hip you to right here in the shownotes. Friday, October 21, 2016, at 8:00 p.m.
November 12, 2016, at 8:00 p.m.
Frontwoman and founding member Gina Coleman credits an appearance in a Williamstown Theatre Festival production of “A Raisin in the Sun” in part for leading her down the path to the Blues (submitted photo). And that’s why this week’s show demonstrates a huge part of the program’s reason for being—why we do what we do here at the Greylock Glass: We bring you up close and personal with artists you may not have heard before, but will be DARN sure glad you did now. And I’m talking especially to you listeners in the U.K., Ireland, Germany, Australia, Japan, and all the other folks who somehow manage to find and tune in to the show. 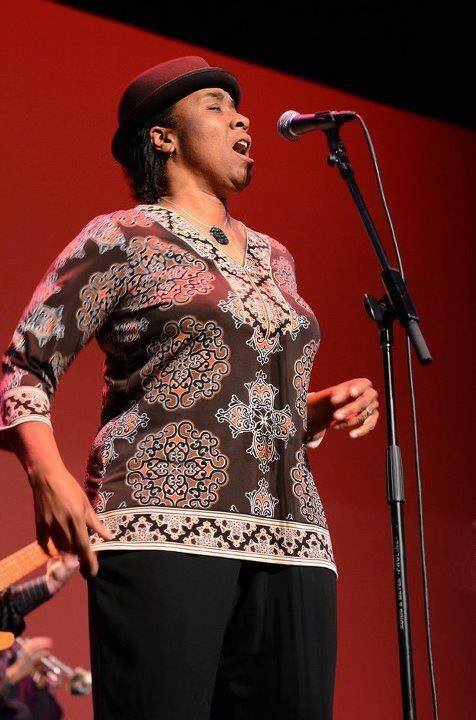 So relax, get ready for a great conversation with Gina Coleman, and prepare to get blown away by the Blues! Check out the CD RELEASE Party Facebook Event and get tickets. Oh, and did we mention? We’re bringing you an EXCLUSIVE on this episode! YOU, dear listeners, are the first to hear a track, “Next Time is the Last Time” off the brand new Misty Blues’ release, Dark & Saucy. The brand So stick around ’til the end for what I promise will be a real treat! For more information about the Berkshire Blues Benefit Jam to support the Berkshire Music School, check out the most recent event listing on Facebook or go to directly to the school’s website. AND don’t forget to explore the awesome father/son comic collaboration, “Awesome Robot Science Fiction Action Comix” Gina described. It’s wicked fun! * We also heard strains of “I Don’t Sleep,” also from Dark & Saucy, between the intro and our conversation with Gina. I’ve just listened to your interview with Gina and it sounds terrific. Well done.